On a Saturday morning last month we went for a Shinkansen ride up to Koriyama and a day of sake making at Kinpou Shuzo–Niida Honke, makers of Odayaka (穏), Tamura, and Shizenshu. Melinda and JP came too, and had thoughtfully brought along a mediterranean selection of breakfast treats, so we all settled into a meal of bread, cheese, salami, and olives marinaded with anchovy–altogether a very pleasant way to pass the short ride through north Kanto to Fukushima. We changed to the bus at Koriyama Station where we began to adjust from the rapid Tokyo pace of Yamanote Line trains every three minutes to buses that run once every three hours. A few other souls boarded the empty bus and we headed out to the farmland surrounding the city. We soon began to to see rustic signs reading 金寳酒造 仁井田本家. One of the kura staff was waiting patiently as we pulled up to the bus stop where everyone on the bus got off. Turns out we were all city slickers from Tokyo on our way out for a refreshing day in the countryside to satisfy our curiosity about sake brewing. The makers of Odayaka did not disappoint: they couldn’t have been any nicer as hosts, more enthusiastic about their sake and their community, or more open in their sharing of the kura for the day. Odayaka has a fundamental commitment to the local farming and brewing tradition and a contagious excitement to share that with anyone who is interested. Pull on the white boots and get your hands in the sake. 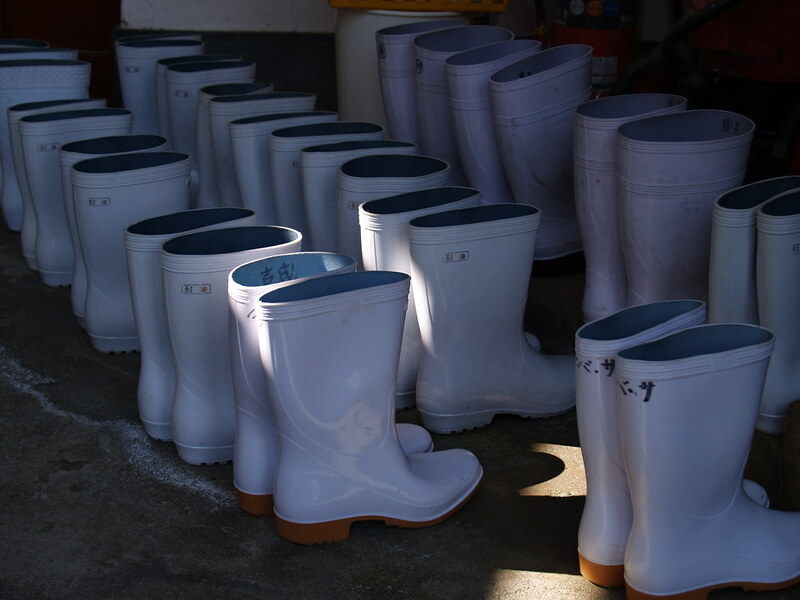 A small herd of white rubber boots sat in front of the door to the 300 year-old kura. Ever conscious of cleanliness and quality control, we were asked to pull on the clean rubber boots, don hairnets, and wash and disinfect our hands. Now were ready to make sake. The first order of business was to carry big sacks of rice over to a work table. These were opened while we went to organize our washing stations. We filled two large wash basins and a bucket with ice-cold water and grabbed a large stainless steel colendar. Et-chan and I received exactly 20kg of the 180kg for the day’s brewing in our colender. When everyone was ready with the same set up, we all dunked our rice and began hand-washing it. I took the first 30 seconds, no more — no less, then Et-chan. The water went halfway up your arms and was terribly cold. Then we switched. Digging deep into the rice and getting it to move around in the water takes some elbow grease. That 20kg of rice is still heavy in the water and you have to dig in. It reminded me of scrabbling in the muck for clams in the summer–except it was painfully freezing cold. After two minutes of vigorous washing, sending the rice whirling through the water until it was a gravelly slurry, we hoisted the colander and poured the rinse bucket over it. 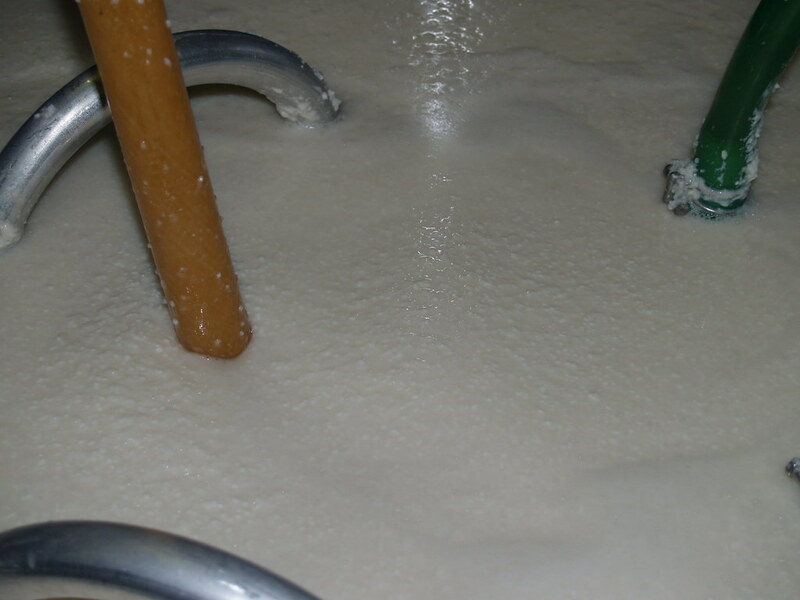 Our wash water had turned white as latex paint. Then, we dunked the washed rice for exactly 28 minutes of soaking. A little clean up of the wash basins and it was off to the brewing room. 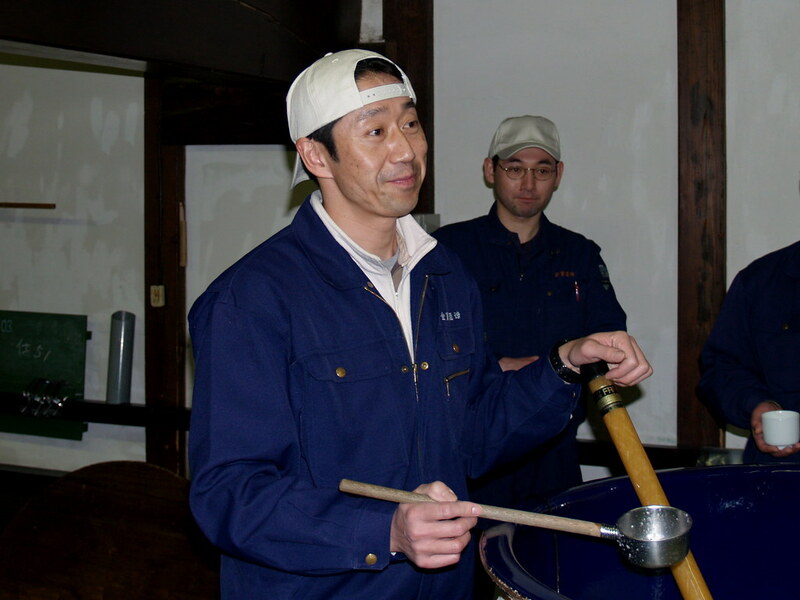 Odayaka had several different batches in progress in the brewing room. 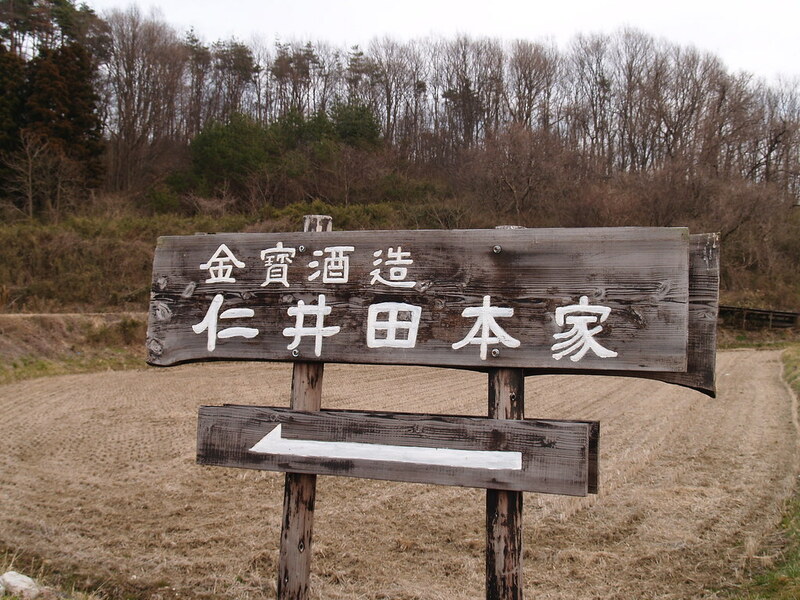 We walked over the dark wood raised platform and peered into the tanks full of brewing sake. 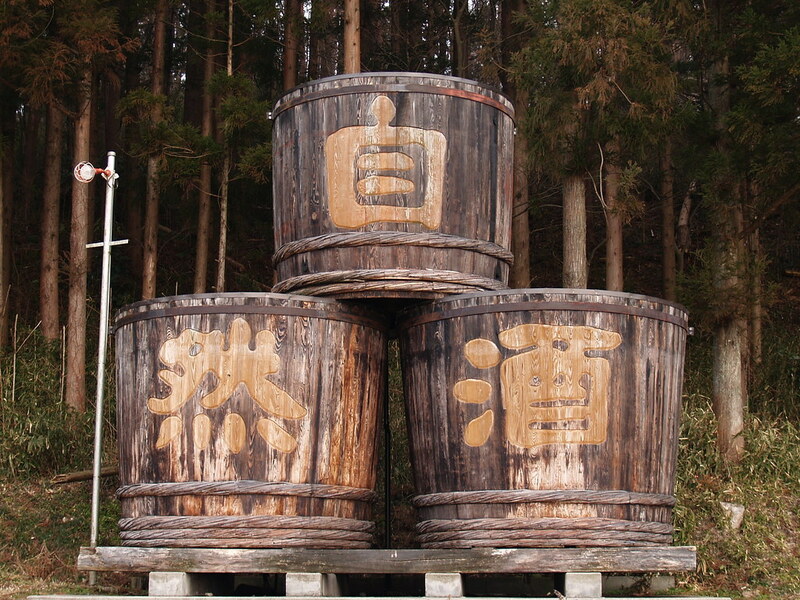 Each 5000 liter tank had computerized temperature control but the brewers at Niida Honke still used some craft methods for their sake. Forsaking the convenience of mechanical mixers, they had a selection of poles with wooden pads mounted crosswise at the end. We all had a chance to plunge these kai into the brewing sake and pull them back up quickly. This broke up warm or cold spots and helped aerate the fermentation. In the same way that a day at Ryogoku watching sumo isn’t complete without a big serving of chanko-nabe, the fresh shunmi-nabe and ika-ninjin we were served filled out our working experience at the kura. 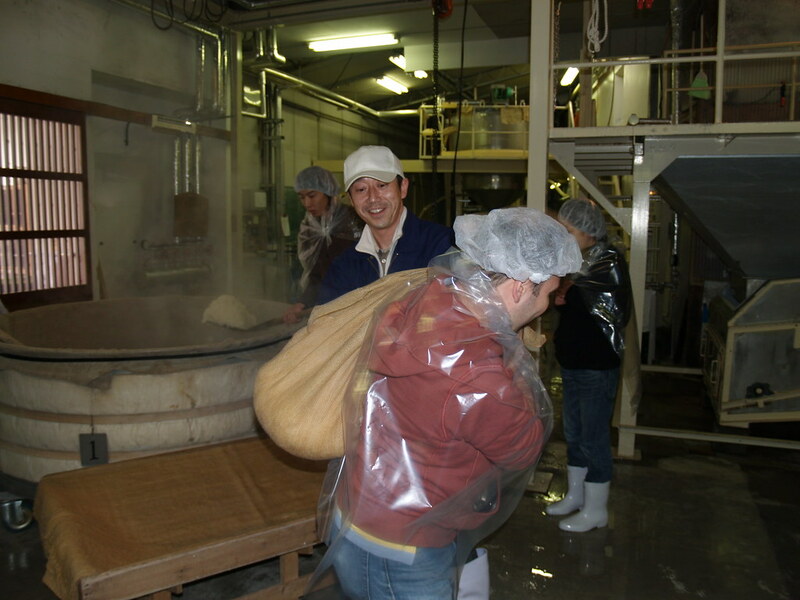 Making sake is cold, hard, physical labor, so the kura-bito need a hot and healthy meal. We didn’t work as hard as they do, but still enjoyed all of the fresh, local veggies, plenty of pork, and the local ika-ninjin. There were piles of onigiri too. These were just plain and simple rice with nori. No fillings or extras were needed to make these taste good. Three per person went out on all of the platters. We could barely get through two, but a bunch of guys sitting near us were happy to help us clear up the left overs. The block-and-tackle mounted rice steamer was amazing. 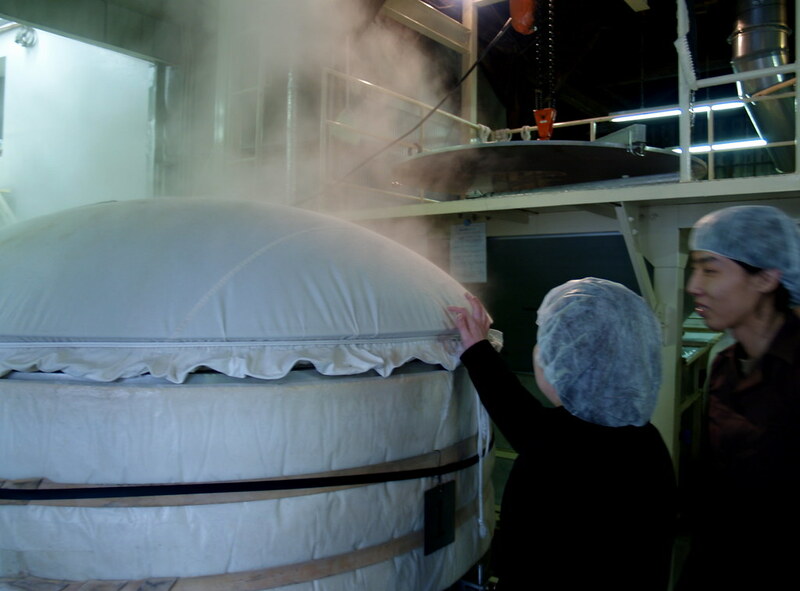 For our demonstration, we had put all of our carefully hand-washed and meticulously weighed rice in the steamer by hand but in the day to day operations, they use a mechanical washer. When finished, the drum tight canvas cover had expanded like a giant Jiffy-pop container. The clouds of steam pressing through the cloth looked great and the smell was fantastic. We got to taste a few of the grains while Niida-san made mochi by hand. No pounding with mallets, he just grabbed a handful and worked it over powerfully on a board to make a baseball sized lump of fresh mochi in a minute. This is the traditional way to check the water content after washing and steaming: too hard and it is too dry–too soft and sticky means too much water. He flattened out the ball of mochi and passed it around. After we all got a look, it was set aside to get back to work. But in one of those telling looks, I spotted Niida-san pick up the mochi later when we were all supposed to be busy, hold it up to the light, and grin. He then held it to his nose and took a deep breath. The smell must have been just right, or maybe just making sake from their own rice is just right, but the look of satisfaction on his face showed a brewer who takes great pleasure in his craft. The last part of our labor was an old style bucket brigade with no buckets. We laid cloth in a kind of shallow trough then shoveled steamed rice out of the massive steamer onto the cloth. The kura-bito made it look easy ot just pull up the corners and sling this mass of hot steamy rice over your shoulder, run to the tank room, pass it down to waiting hands on a lower floor. There the workers through the hot rice into a small tank which was already actively bubbling away with a starter of doburoku. We made as many trips as quickly as we could until all of the rice was added to the mix. We all gathered back in the tank room for a taste of doburoku. This is lower alcohol, still living sake that has a real tang and fizz to it. You can feel the active fermentation of this homebrw style on your tongue. It is like a cross between sake and rice pudding–two of my favorite things. The rice is still very much there in the sake. You can see the grains, and feel them, while you sip. This doburoku was the same style as what we were making as part of our work-experience at Niita Shuzo. Ours would be ready in about ten days. We ordered a couple of bottles to share later: one was very nice, but the other was a bit of an adventure, but that is for another post. The active not yet complete doburoku had a quite a bit of sweetness, but becomes drier as it reaches a more complete fermentation. Now that we had taken part in each stage of the sake brewing process, the serious tour began (See all of the rest of the pictures on Flickr). They opened every part of the kura to us. This was an amazing opportunity and really expanded my understanding of sake. Though I had listened to lectures and read books, there is no substitute for seeing the scale of the rooms and tanks, walking in the footsteps of the kura through every stage of production, feeling the cold and the heat, the open air and the closed culturing rooms. 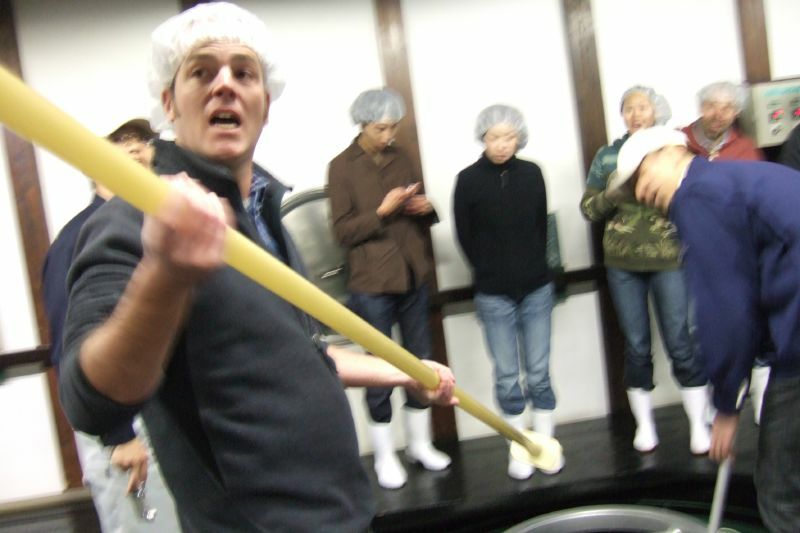 We could taste the semi-sweet flaky grainsMost of all, the wonderful smells changed at each stage: and those smells are the smells you get in a good sake. And did I tell you we violated the law? Whoa, what chu talkin’ bout, Willis? What did Etsuko say you had wrong, Ted? And what’s all this about breaking the law??? I will tell you these secrets next time I see you.